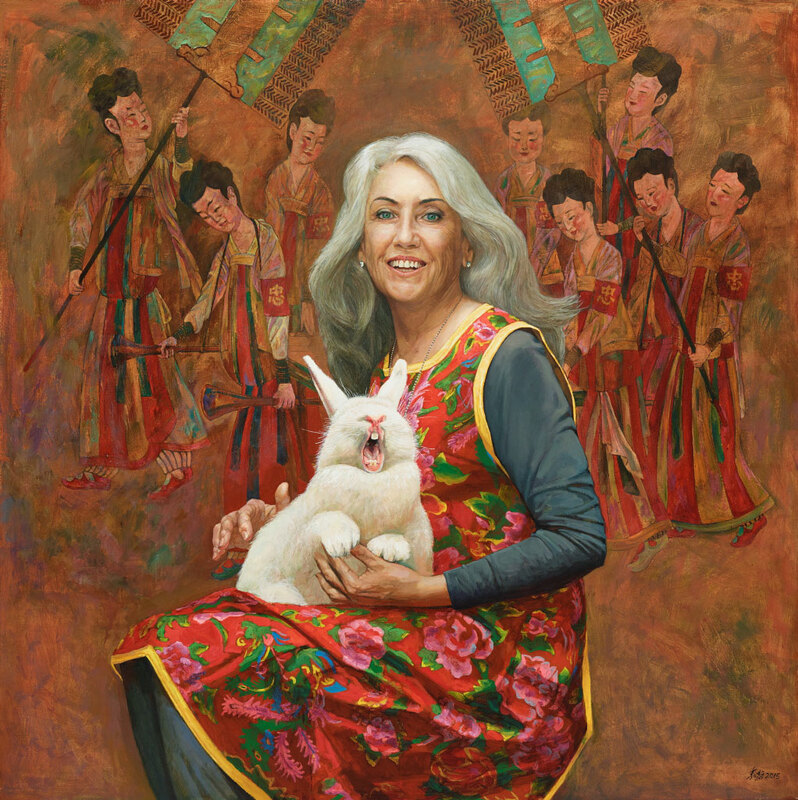 Judith Neilson is the founding director of Sydney’s White Rabbit Gallery, which holds the largest collection of post-2000 contemporary Chinese art outside of China. Jiawei Shen has known her for more than a decade. In 2003, Neilson collected three of Shen’s important history paintings, including his 2002 work 1972 Imperial palanquin: after Yan Liben , a detail of which serves as the background to this portrait. ‘Yan Liben’s (601‒673 CE) masterpiece Imperial palanquin was a typical work of traditional Chinese court art from the Tang dynasty. In Judith’s clothing, we encounter another kind of traditional Chinese art: folk art,’ says Shen. In post-1949 China, a third art tradition – ‘revolutionary realism’ – was established, and Shen’s early works conformed to that. Yet in 1972 Imperial palanquin he flaunts that tradition by poking fun at the historical characters depicted. Another kind of art was born in China in 1985: contemporary Chinese art. In this portrait it assumes the form of a white rabbit. ‘In 1965, German artist Joseph Beuys created his famous performance artwork How to explain pictures to a dead hare . My portrait of Judith is an echo of Beuys’ work from Down Under,’ says Shen. Born in Shanghai in 1948, Shen was an artist of considerable fame in China before he relocated to Australia in 1989. He has been a finalist in the Archibald Prize 13 times previously, and was highly commended in 1997. He won the Sulman Prize in 2006.